A natural alternative for every day skin care. For use as skin conditioner, massage oil, or bath additive. This all natural oil softens and soothes. Regular use will help restore healthy skin tones. 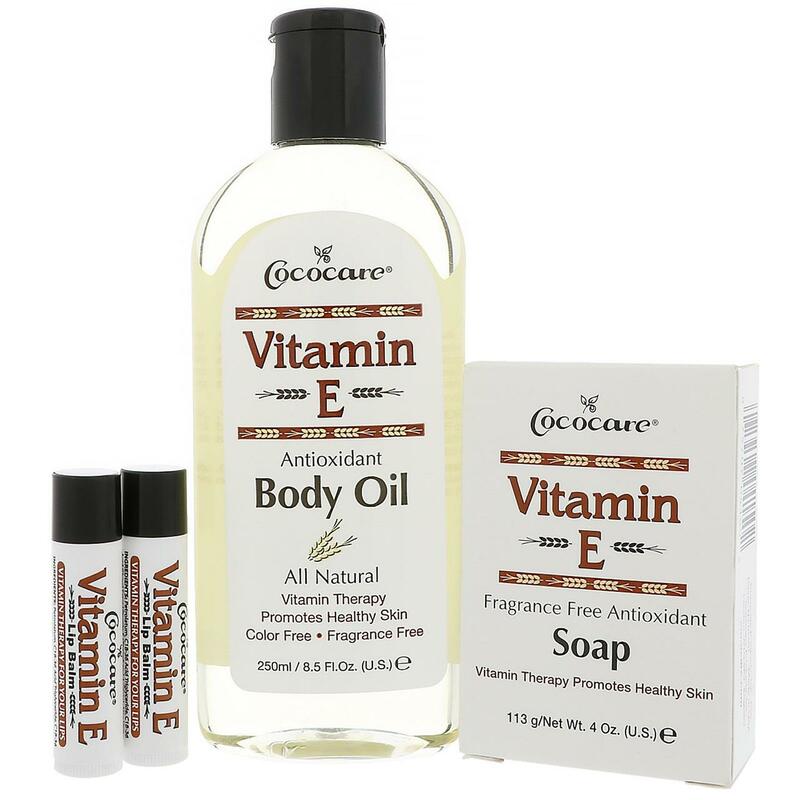 It's more than soap...Cococare's Vitamin E Soap has a rich, moist lather that conditions, protects and gently helps you to maintain a natural glow. Pure soap without perfume. Ideal for all types of skin. Vitamin E Antioxidant Body Oil: For external use only. For skin care or massage, apply and stroke. For bath, add 1 to 2 capfuls to water. Vitamin E Soap: Rub bar to create lather. Massage over body. Rinse thoroughly. Vitamin E Lip Balm: Apply to lips. Repeat as needed. Vitamin E Antioxidant Body Oil: Soybean oil (glycine soja), safflower oil (carthamus tictorius), vitamin E (tocopheryl acetate). Vitamin E Soap: Sodium palmitate, sodium palm kernelate, sodium cocoate, water (aqua), glycerin, tocopheryl acetate (vitamin E acetate), sodium chloride, trisodium hedta, titanium dioxide (CI 77891), ultramarine blue (CI 77077), talc. Vitamin E Lip Balm: Petrolatum, C18-36 acid triglyceride, C18-36 acid glycol ester, vitamin E (tocopherol acetate), aloe vera extract (aloe barbadensis), cocoa butter (theobroma cacao), fragrance (parfum), propylparaben, butylparaben.